It was Janet Malcolm, the remarkable nonfiction author, who questioned the gullible relationship between a person being interviewed and the journalist. The journalist will use his or her wiles to pretend to be the interviewee's friend, in order to find out what the journalist wants to know. Then they ruthlessly use whatever sentences they want, discarding the rest, to build their own 'story'. There is no objectivity, and indeed Malcolm says objectivity can, at best, be a rhetorical device (a pretence). It is up to a journalist to balance ethics, credibility and a sense of the true story. I say all this in reference to a ground breaking article that appeared in Saturday's NZ Herald a fortnight ago (21/06/14). This was partially - very partially based - on an interview I had with Herald journalist Andrew Stone. The fact is I had in effect created the news story, which broke the news that Kereopa Te Rau had been pardoned. I had contacted Linda Herrick, book editor of the Herald, asking if the Herald was doing anything on 'Journey to a Hanging' whose arrival in book shops was imminent. She told me she had passed the book onto Andrew Stone, a news journalist at the Herald. I appreciated the fact the book was moving from the book pages to news, so I contacted him by email on 13 June 2014: I told him my book was coming out soon and this was the 'hook' I dangled. I wondered about - how do you write about a sore spot in the national psyche in minefield of 'The Age of Apology'. On one hand you have horrors, like eating eyeballs, turning a missionary into a moko mokai and a show trial and a retributive hanging of the man held responsible - and on the other you have a contemporary sensibility which is couched in 'saying sorry' for the mistakes of the past. How do you juggle all these contemporary and historical factors - iwi sensibility, your sense of the importance of following your own path...and making a call. Or would it be an easier ride not to make a call and just 'say sorry'. This was followed up two days later by a further email from me. I think I left out the most interesting detail. In early April 2014 Kereopa Te Rau received a pardon from the Crown but this fact received no publicity at all that I know of. It was carefully buried within the Ngati Rangiwewehi Claims Settlement Bill. My question is: what is a pardon worth if nobody knows anything about it? The silence seems to underline the fact the event still has potentially explosive echoes in the present. Or is it 'just unimportant'? What I was implying here was that the silence that surrounded the Crown pardon of Kereopa Te Rau - now two months old - was not accidental. It had not become public because the feelings round it were still raw and Kereopa's iwi - and Crown - did not know how it would play out in public. I called it a 'pardon by stealth' and questioned its real value, given the silence which surrounded it. We’ve got your book. I’ve had a peek. It’s terrific. Can I call you abt it, in the next day or so? By the way the pardon of Kereopa passed under the radar. So does that make it two pardons for Carl Sylvius? And if they didn’t do it, then who did? He arranged to call me at 3pm on Wednesday 18th June. He said he would do an article for the coming Saturday. When I demurred, hoping it could come out when the book was actually in the bookshops (4 July) - my side of the quid pro quo - he said he 'was going away on holiday'. So it was this Saturday or never. He rang me on the Wednesday a little late and we talked for over 45 minutes. He said, inter alia, he had spoken with Mrs Te Rangikaheke Bidois (he struggled to pronounce her name) - iwi spokesperson for Ngati Rangiwewehi (Kereopa's iwi) and she said, she was 'just wondering as she drove along that morning about the fact there had been no publicity about the pardon'. He questioned me on many different things and I answered to the best of my ability. I was very aware of being cautious in my utterances, and even-handed. But we did, in the end, get down to tin tacks and I explained to him that - to the best of my knowledge - Kereopa Te Rau had acknowledged responsibility for the killing of CS Volkner, although he did not literally hang CS Volkner. I also explained that my understanding of the pardon was not that it implied Kereopa Te Rau's innocence - rather that the pardon was an act of forgiveness - an attempt to heal the wounds of the past. This points to the ambiguous position of the Treaty processes which have to be both a truth and reconciliation mission - yet the fact is these two aspects - truth - historical truth - and reconciliation are not always mutually compatible. Reconciliation points towards apology and the embrace of empathy. Truth points in a harsher, pricklier direction - what actually happened when and in its true sequence. I opened the Saturday Herald with some anticipation - but also trepidation. Soon enough, as I sped-read the article, I felt the familiar sense of being betrayed. The article seemed to bear no relationship to the private conversation I had had with Stone. While he had seemed enthusiastic about my book in conversation , in print it was introduced as an 'also ran' - 'For author and film maker Peter Wells, the Crown's pardon came too late to be included in his new book'… Moreover it became clear from the way the entire case was being presented he had swallowed hook line and sinker the ahistorical Treaty and iwi presentation of Kereopa Te Rau's case. Don't get me wrong. I think there were many wrong things in the December 1871 trial of Kereopa Te Rau in Napier. But the case for Kereopa's 'innocence', as outlined in the Herald, was a muddled mixture of conjecture and post hoc conclusions. This story is terrible. The only problem - and it is an enormous one - is that Kereopa Te Rau never once attributed this as a source of his actions. (He never once mentioned it.) Even when he was on trial for murder - and he decided to take the stand and defend himself - he never mentioned what would have been a very clear vindication of his actions. What are we to make of this? That he was a warrior and disdained to mention personal feelings? Or is it significant that this story only emerged many years after he died. It never came from his own lips. It was never talked about at the time. It may have been a deep and private hurt. But as for it being a motivation - we need more evidence of such a terrible event. What for example are the names of his wife and two daughters? Even in the Treaty document they remain unnamed. I know all my ancestors who were alive in 1865, I know their names and birthplace. It is not that long ago, after all, in terms of family memory. These are small but significant details. I want to be persuaded with fact. Both these statements are drawing post hoc conclusions which bear little relationship to how people saw things at the time. In 1975 - a century after the killing - an Auckland University historian Paul Clark made a discovery. CS Volkner had sent letters to Governor Grey outlining Whakatohea's suspectability to joining in the war with Waikato. He did send a plan of a pa of Rangiaowhia as given to him by a kupapa - a friendly Maori. It was inside this pa that the alleged burning to death took place. People ever since have drawn direct lines between the existence of these letters and used them as an excuse for CS Volkner's killing. It lends a kind of primitive justice to an otherwise inexplicably violent act. CS Volkner was discovered to be a spy and was killed as a response to this discovery. The only problem with this is again - evidence. In the runanga the night before CS Volkner was killed, there was effectively a long night's discussion on whether or not to kill Volkner. Not once was spying ever mentioned as a motive. The burning to death at Rangiaowhia and the pa plan certainly never featured. In fact the discussion was really about which god was most powerful - the new Pai Marire religion, with its ability to consume an entire tribe in a sort of Game of Thrones magic fire - or the older Anglican/Christian God which was now yoked to the British army? Which one would reign supreme? The priest arbitrating this dispute or discussion was Kereopa Te Rau, who presented himself as an awesome fiery figure full of magic powers and divination. Whakatohea wanted to present the other Anglican missionary present - TS Grace -as a sacrifice. 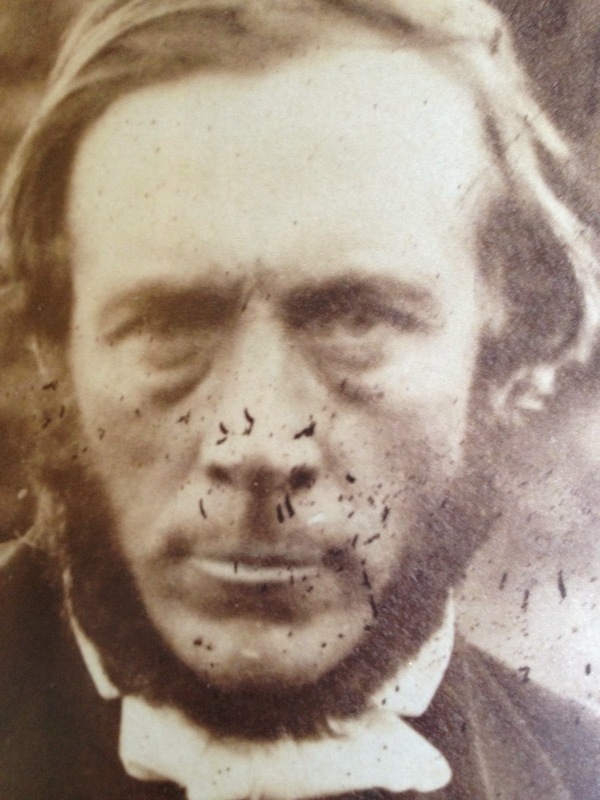 He was, after all, not 'their own' missionary. But as a test - to prove their bowing before the awesome power of the new god - Kereopa Te Rau insisted Whakatohea hand over 'their own' missionary - C.S. Volkner. So at the very least Kereopa Te Rau was the person insisting on the sacrifice of CS Volkner. A complication is that Kereopa did not actually join the hanging party. He says he stayed inside Hiona, Volkner's church. So although he may have inspired the sacrifice and took part in the ceremonies around the beheaded head, plucking out its eyes, he did not literally haul CS Volkner up on the rope. But when Volkner's head was either passed to him or thrown in the window, wrapped in cotton or linen, he then extracted the eyes and ceremonially drank Volkner's blood and asked or demanded that the congregation do likewise. Stone says Maori buried Volkner but it was in fact British sailors along with friendly Maori who dug Volkner's grave and quickly buried him, the sailors carving a simple wooden plaque. All this may seem pinpricking detail. But these small indirections or inconsistencies build up to present an essentially false picture. 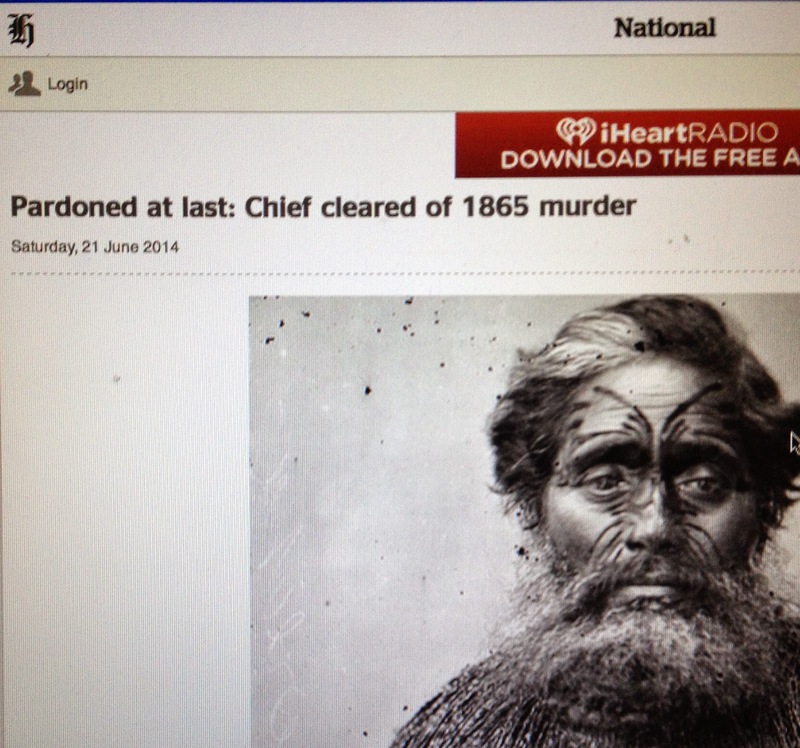 It means the headline 'Pardoned at last: Chief cleared of 1865 Murder' is not literally true. My understanding - from the Treaty office - was that the pardon was by way of forgiveness - an act of understanding and empathy. The article tries to assert that Kereopa Te Rau did not eat Volkner's eyes - it becomes 'the claim that Kereopa had removed Volkner's eyes with his fingers and eaten them'. This is absurd. There were so many eye witnesses and he himself admitted it to various people, including Suzanne Aubert. In fact he believed the eye eating was the act that so inflamed public opinion against him - rather than the death of CS Volkner overall. He also said that he knew the eye-eating would have fateful consequences when he almost choked on one of Volkner's pale grey blue eyes. I suppose my big picture feelings are these: it is apt to forgive Kereopa Te Rau and his actions. He did not have a fair trial in 1871. He was acting within his understanding of the time. I believe he should be pardoned. But I also feel this as strongly, in terms of natural justice. Maori believe it is very important to return moko mokai (shrunken heads) to their whanau. The government has spent much money on groups of Maori travelling to overseas museums to bring back these heads, which are then granted the grace of a proper burial. In other words CS Volkner's head was last seen in Kereopa's hands. I believe it is the other half of the settling of the wounds of the past that Kereopa Te Rau's iwi regard it as a responsibility that they locate and return the moko mokai to the remains of Volkner's body at Opotiki. Then justice is done, justice is seen to be done. All sides can rest easy and a natural balance of justice is restored. Peter, I haven't seen your book, but in your blog you seem to suggest that what happened at Rangiaowhia was not a factor in Volkner's death, that it was brought up years after. But a letter sent by the Opotiki runanga to the Government immediately after Volkner's death explicitly mentions the killing of women at Rangiaowhia.